In contracted braille (UEB) with picture descriptions. Includes the print/braille book, a crayon organizer (crayons included! ), and two raised line drawings to color! Don't miss the hilarious sequel, The Day the Crayons Came Home! FEATURED BOOK! The Day the Crayons Quit is the second book in our Great Expectations series! 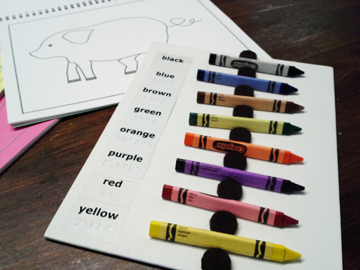 Check out all the color-related activities we've created to enhance this book! In this #1 New York Times bestseller, poor Duncan just wants to color. But when he opens his box of crayons, he finds only letters, all saying the same thing: His crayons have had enough! They quit! Beige Crayon is tired of playing second fiddle to Brown Crayon. Black wants to be used for more than just outlining. Blue needs a break from coloring all those bodies of water. And Orange and Yellow are no longer speaking - each believes he is the true color of the sun. Kids will be imagining their own humorous conversations with crayons and coloring a blue streak after sharing laughs with Drew Daywalt and New York Times bestseller Oliver Jeffers. This story is perfect as a back-to-school gift, for all budding artists, for fans of humorous books. We are also offering some tactile coloring books from Tactile Vision - in case the coloring bug bites! The crayon organizer - free with book purchase! "A comical, fresh look at crayons and color." "I am not ashamed to admit it, I'm 41 yrs old and just purchased this book...for myself! I work at a library and when this book came in every person who read/looked at this book said they were going to purchase this book for either a child, or children in the family, or for themselves! I can't say enough good things about this book, do yourself a favor buy it! You'll smile and laugh and love it each time you read it!"